Diethanolamine (DEA) is manufactured in huge quantities and is used in a wide range of processes and products. E.g., it is used as a surfactant, corrosion inhibitor, and to scrub hydrogen sulfide from refinery process gases. It is also used as a wetting agent in shampoos, lotions, creams and other cosmetics. DEA is usually measured using chromatography, such as HPLC or IC. This instrumentation is expensive, maintenance intensive, and has low sample throughput. In response to a customer request, we developed a Zone Fluidics method which is simple, fast, and uses relatively low cost instrumentation. Global FIA has developed an innovative approach to sampling pharmaceutical processes and automating the introduction of the sample into process instrumentation such as chromatography and mass spec. Several years ago, Global FIA defined Zone Fluidics and has subsequently expanded its use to include sample preparation prior to analysis. A further expansion of Zone Fluidics capabilities to include process sampling now allows Global FIA to provide a versatile interface between a chemical process and process or at-line instrumentation. The first unit operation that Global FIA tackled is dilution. Often processes are operated with reaction constituents at elevated concentration levels even above the saturation point of the reactant. Global FIA has developed Zone Fluidics dilution techniques that allow large single step dilutions (>250X). Larger dilutions can be achieved by carrying out serial dilution steps. For a large single step dilution using Zone Fluidics, we have achieved a repeatability of less than 0.7%. On the sampling side, we have developed a sampling probe designed to withdraw a sample at elevated temperature (up to 75ºC) without the concern of the sample crystallizing out when it cools. The sample probe can be configured with a few different probe tips. One allows the sampling of heterogeneous samples. When equipped with a small porous Teflon™ filter, the probe can exclude solids. Another probe allows sterile sampling. 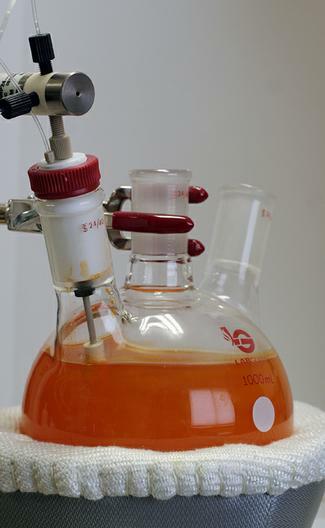 One is under development that will allow samples as small as 2 µL to be drawn from the reactor. The materials used in the probe have been selected for maximum chemical compatibility. The mounting arrangement allows for sampling reactors of different sizes.